Nora, Sarah, Dell & Otto say Happy Birthday to the best dad in the world! Ray, hope your day is as special as you are… we love you tons. See you soon! Don’t spoil the covert operation… Nora doesn’t know it is her birthday today. We are celebrating a month late (on October 13th), due mostly to the Salesforce.com Dreamforce conference that Dell attends each year, but no worries, she doesn’t know the difference… she still doesn’t have the months/days thing down yet. I bet we wouldn’t be able to pull the wool over her eyes if this was her sixth birthday! We have had a nice mellow hang-around-the-house day. We have been organizing closets, doing laundry, and kitchen cleaning. The birthday girl watched a few episodes pf Mickey Mouse Clubhouse, Wow Wow Wubzzy, and some Power Puff Girls. 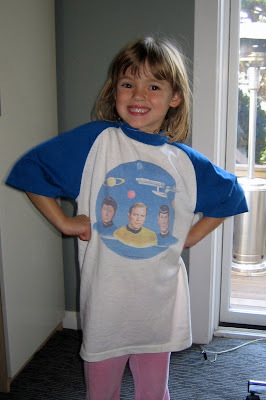 The high point was watching an old Star Trek together… the impetus for the vintage tee in the photo. That tee was Dell’s when he was a little kid, and Mama T passed it on to us. Nora still isn’t quite big enough for it, but she’s getting close! When we dropped Dell off at Dreamforce this afternoon, Nora fell asleep in the back of the car with a My Little Pony coloring book on her lap. She is having a great birthday, even though she doesn’t know it is a special day. But when you are five, every day is a special day, right? 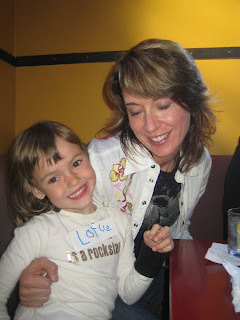 It was a “rockstar” party, so Nora wore her “My mom is a rockstar” tee, but we pinned a Nora-hand-written note over the top replacing mom with Lotus, because Lotus truly IS a rockstar. Nora didn’t last too long, as it was pretty loud, and I gave her a Shirley Temple before giving her food. I should know by now… but I got her out of there pre-meltdown. 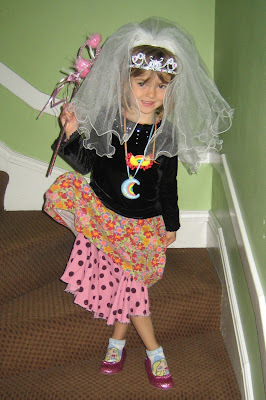 Unfortunately, I didn’t avoid the meltdown — it DID happen, once Nora realized we weren’t going back to the party. 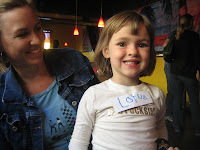 Anyway, Happy Birthday Lotus! 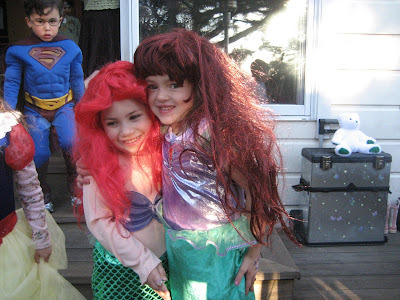 We had fun at your party (while Nora lasted). Shelly and Chad checked into CPMC around 8pm Mon 5/7, while Meena (Grandmama Joan) & Papa Ray stayed with Grant at his house. They started to induce Shelly around 9:45pm, and contractions started in earnest around midnight. The epidural was given (yeah!) around 2am Tue 5/8. Shelly called me at 5am to say I should get there before 7am, so I showered up and headed over to CPMC. I got there around 6:30am, and it was perfect timing, because about 6:45am, Shelly’s water broke. Then it all happened like gangbusters! She dilated from 6cm to 10cm in only 20 minutes (thank God for the epidural!). Shelly started pushing just before 8am, and after a mere 35 minutes of pushing, Quincy Joan Suzanne Lyon entered the world at 8:28am. WOW! Just like when I was there for Grant’s birth, I am totally humbled and awed by my sister and the miracle of birth. Shelly is such a strong person, a wonderful mother, and I am so ecstatic for the birth of her daughter Quincy. I am getting all teary-eyed just writing this! Anywhoo, CONGRATS Lyon Family, and welcome Quincy — you are soooo loved! Quincy’s first video – she is getting all cleaned up just a few minutes after being born. Listen to the lungs on that little gal! Quincy’s first serenade is “Rockabye Baby” from Cousin Nora. 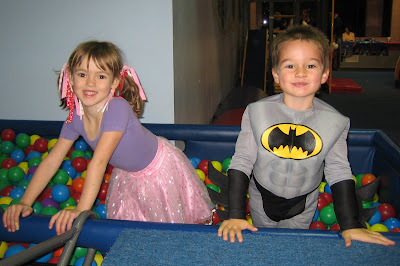 One of Nora’s friends from Children’s Village celebrated her 4th birthday in super princess fairy style! Kelsey and her parents had a fun bash for all of us. 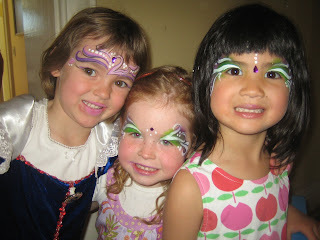 Tinkerbell showed up and did face painting, magic trick, balloon animals… she was amazing! It was a great party! 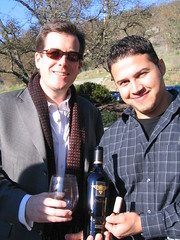 Joel was so kind to turn 40 and let us tag along on his birthday bash wine tasting in Napa. We hit Miner (“The Oracle” wine is amazing! ), Paraduxx (so-so wine, but beautiful space for tasting), and Patz & Hall (livingroom-esque tasting salon, and great pinot noir wine). The thirteen of us crammed into a van up and back to Napa – felt just like a teenage ski trip or something… singing, razzing, flatulating, dorito-ing. I hope my 40th birthday is as much fun! View all the photos on Flickr (Kotara’s + Thompson’s combined).